Iran releases detained U.S. sailors. 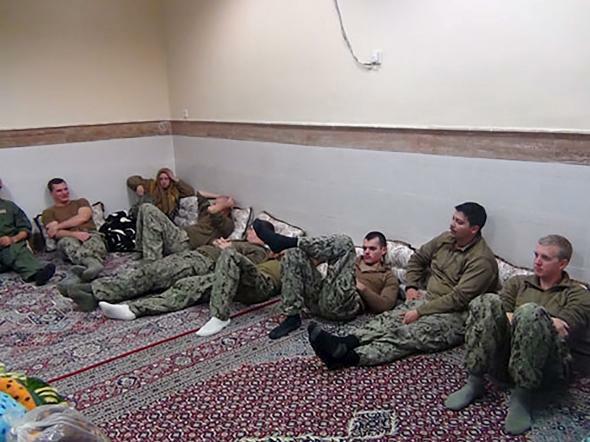 A picture of the briefly detained sailors released by Iran’s Revolutionary Guards. The Times spoke to a “prominent conservative” connected to the Iranian regime who said the situation was resolved in part through contact between Secretary of State John Kerry and Iranian foreign minister Mohammad Javad Zarif, who worked closely on the multinational deal to relax economic sanctions on Iran in return for a curtailing of its nuclear program. Since Iran appears to have complied with the restrictions on its nuclear facilities, those sanctions could be officially dropped within days—timing that may not be coincidental to the U.S. sailors’ prompt release.